The Barrio de San Pedro Telmo is an architectural gem. Until the 1870 yellow fever epidemic, that decimated the city’s population, it was the center of life in Buenos Aires. It’s neo-classical and Spanish colonial architecture defined the capital of a barely unified nation. 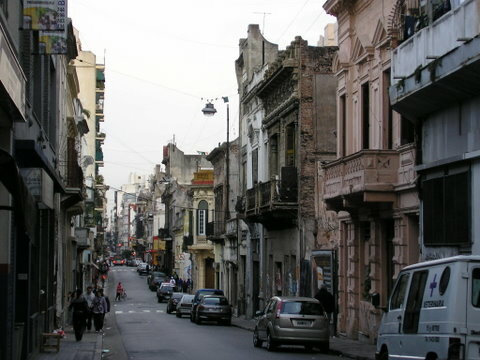 But just as the civil wars came to an end, San Telmo became a ghost town as the elite fled the mosquito infested dock area for the cooler, higher grounds of what are now Palermo, Ritero and Ricoleto. Even though the barrio directly bordered the government center at Plaza de Mayo, it sunk into a slum for the next century. Oddly enough, as its once grand buildings crumbled into tenements to house the ever growing population of immigrants, San Telmo thrived as an area for food markets and very expensive, high end antiques - but you didn’t walk around at night. 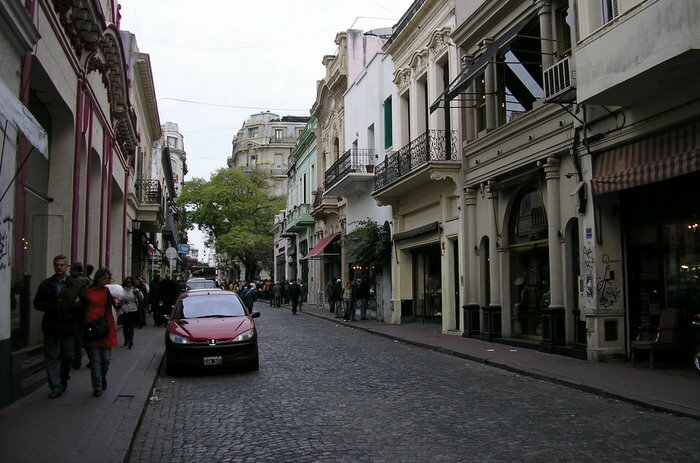 The revival of democracy in the 1980’s has been kind to San Telmo as artistic freedom thrived and artists discovered the wonderful old buildings. Naturally, investors were not far behind. Today San Telmo is an up and coming barrio with trendy boutique hotels, once crumbling buildings restored as condos, upscale restaurants, excellent tango clubs and still the best and most expensive antique shops in Argentina - yet, unfortunately, still don’t walk around at night by yourself! 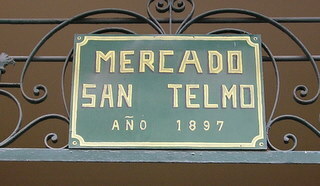 Some years ago, the city began to sponsor a Sunday market known as the Feria de San Pedro Telmo. I wish I could recommend it as a good use of your time, but I can not. I’ve been there twice over two years and have been increasingly disappointed. 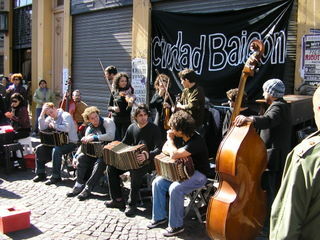 In 2008 the central Plaza Dorrego and the surrounding streets were crowded with craft and antique stalls and performers of exceptional talent. 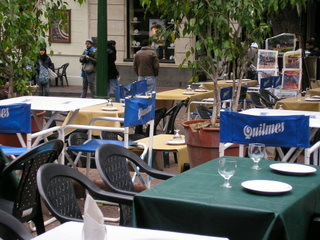 In 2009 Plaza Dorrego was devoid of stalls and replaced with nearly empty tables franchised out to cafes with over priced drab menus. The surrounding streets were nearly empty of people looking at the many folding tables selling the same “made in China” souvenirs one finds in the cheapest shops - some of the lowest quality souvenirs I’ve seen anywhere in Argentina. Many of the “antiques” were collectables at high prices one can find cheaper on eBay - if interested at all. The street performers were few and amateur. (The excellent street performers are all at the Feria de Mataderos .) 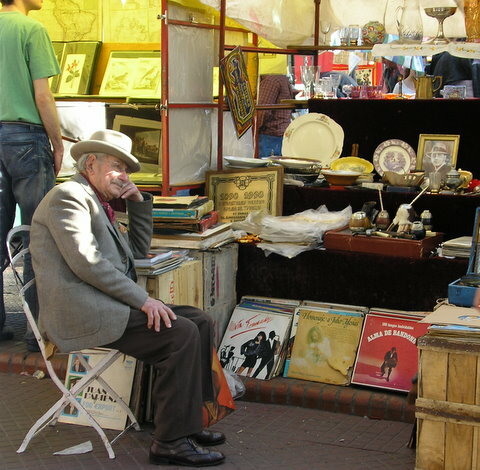 Antique or even collectable stalls were non-existent. The "brick and mortar" antique stores were open selling excellent merchandise at Manhattan prices that no tourist could ever take out of the country and few locals out on a Sunday can afford. 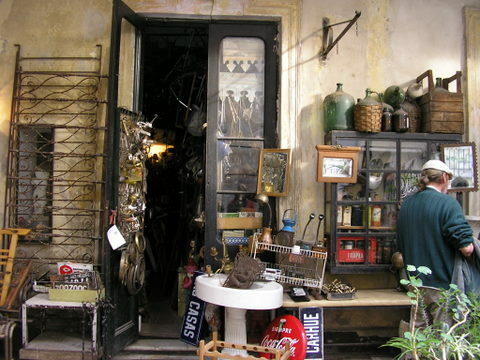 During the week many antique stores are open only by appointment. 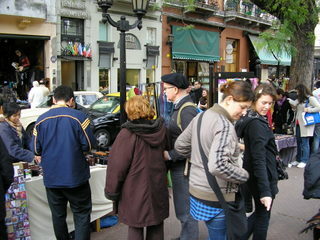 My one delight is wandering into the Mercado de San Telmo , on Avenida Defensa, the old produce, meat and fish market. When I rent an apartment in the city, it’s the only place I do my shopping!